Want to be hired by Darryl? Hello, we are two full time working parents, who require some date night and odd weekend help. Beautiful and active girls, 7 and 2, in our home. 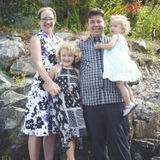 Searching for a nanny for a great family in East Vancouver, near the PNE.